A discerning psychological reading of a highly fraught writer's life. Meyers (Gary Cooper, 1998, etc.) sifts through Orwell's celebrated adventures, finding strands of anxiety that influenced his great works. To begin with, Orwell's father was no authority figure: a mid-level civil servant in British India, he made little money overseeing the cultivation of opium and was absent for most of his son's childhood. In grammar school and at Eton, Orwell suffered from his status as a scholarship boy, succeeding academically but socially never fitting in. Despite his antipathy toward his father and the culture of his public school, however, Orwell went on to join the Burmese Imperial Police—a sign of the grip his background had on him. 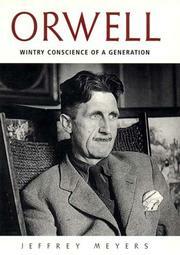 Meyers argues that this conflict recurred throughout Orwell's life. He was regularly caught between a sense of duty and his own unique, and often critical, perspective of the institutions that influenced him. Meyers links this analysis with allusions to fiction and essays (like "Shooting an Elephant") to show how art took its cue from life. Tramping around France and England—dropping out of life, pitching the dilemma entirely—helped resolve this conflict enough for him to work as a schoolmaster and write his first book. Leaving everything behind and taking the big risk (i.e., fighting in the Spanish Civil War) inaugurated the blossoming of his career, however. He overcame his feelings of inadequacy and began actively developing his political theories, asserting that totalitarianism on both the Left and Right were jeopardizing democracy and individualism. The gentler side of Orwell comes out in Meyers’s discussion of his family life. His rather mundane (yet sweet) courting of Eileen O'Shaughnessy, the strain WWII placed on the marriage, and their adoption of a son placed Orwell in a rare role. He seemed wide-eyed and open, a far cry from his usual self-tormented or icily perceptive self. A biography that rounds out a writer whose life has been distorted by the mythic proportions of his experiences.